Mr. Abram far right. 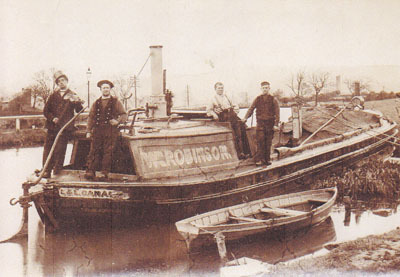 Boat family from Burscough. Dave Middlehurst of Chorley (d.middlehurst@btinternet.com), who is researching music and musicians in Lancashire between 1870-1920, sent this photograph. He says it came from a boat family from Burscough named Abram and shows four men on their boat - one in a top hat playing a fiddle (left) and "Mr Abram" on the right. He hopes that someone may be able to help find out more about the boat and the music.